Team news as Bath host Harlequins in Saturday's Premiership fixture at The Recreation Ground (15:00 GMT). 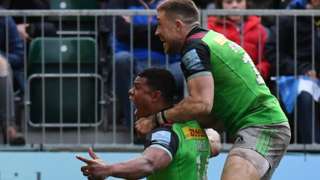 Harlequins win a fifth Premiership match in a row as Nathan Earle's last-ditch try beats Bath 31-29. Team news as Leicester Tigers host Wasps in Saturday's Premiership fixture at Welford Road (15:00 GMT). 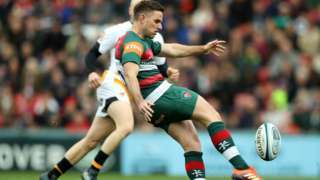 Joe Ford scores all Leicester's points as the Tigers hang on to narrowly beat Wasps in the derby at Welford Road. Team news as Sale Sharks host Exeter Chiefs in Saturday's Premiership fixture at the AJ Bell Stadium (15:00 GMT). 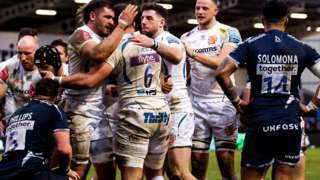 Premiership leaders Exeter Chiefs stay top with a narrow victory over Sale Sharks at the AJ Bell Stadium. Team news as Saracens host Northampton Saints in Saturday's Premiership fixture at Allianz Park (15:00 GMT). 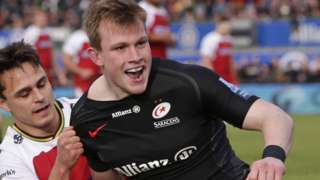 Saracens score six tries as they return to winning ways in the Premiership by beating Northampton 36-17.